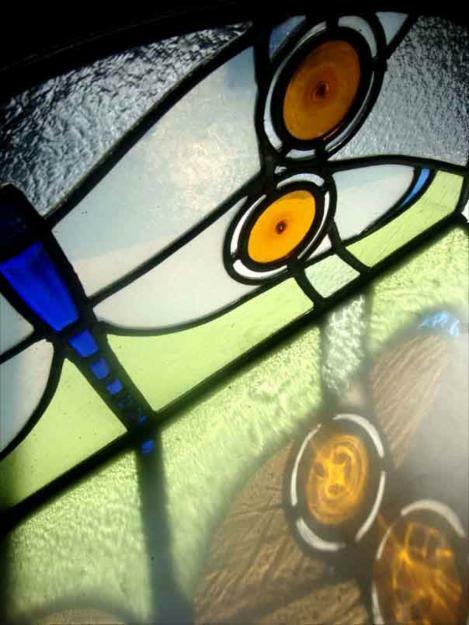 The process of making stained glass has remained virtually unchanged for hundreds of years. The possibilities for its appearance and for its use however, are constantly evolving. 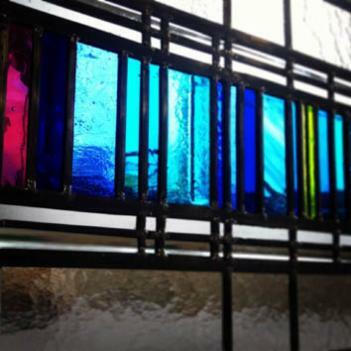 We offer a unique approach to the design and application of contemporary stained glass. Fused Glass is a technique of 'fusing' different layers and colours of glass together. This gives the glass great texture and depth- the possiblities are endless. 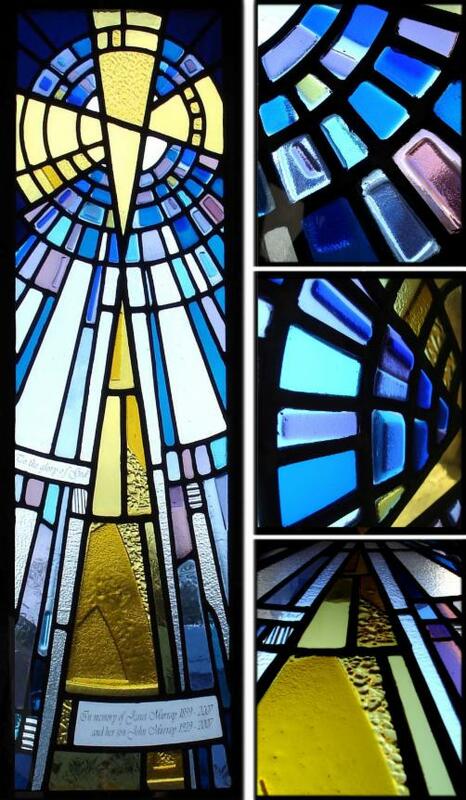 Below is a selection of windows incorporating fused glass panels- leaded in the traditional method. A 16 panel, 3 metre tall, half landing window for a house in Pollockshields, Glasgow. The border starts with purple glass at the top blending with blues and finally greens at the bottom. The centre mixes clear with etched and bevelled glass. Fused glass skylight, Bearsden, Glasgow 2014. Incorporating Bullseye fused, English Antique, etched and bevelled glass. 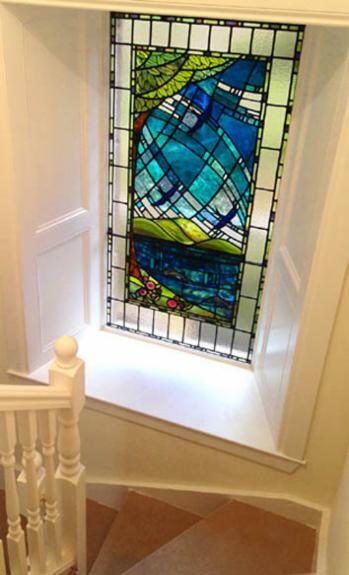 Stained glass alf landing window using fused, Tatra, English Antique and reclaimed glass. Fused glass window, Glasgow tenement. 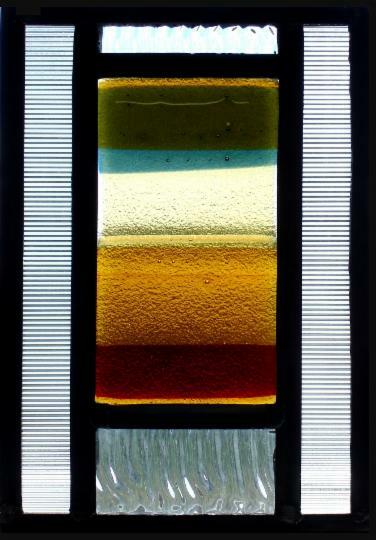 Four colours of Spectrum glass' were used to make this simple but effective fused panel. Two contrasting textured glass were used in the leaded border. Memorial window, Rorison Memorial Church, Ashgill 2008 Fused and leaded panel. Most of the pieces of glass making up this window have been fused, this gives great colour and texture and really sparkles when the sun shines through it. One of two windows for a home in Pollockshields. 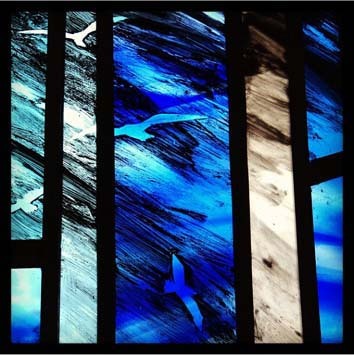 Fused glass panels, 2011, Airth. 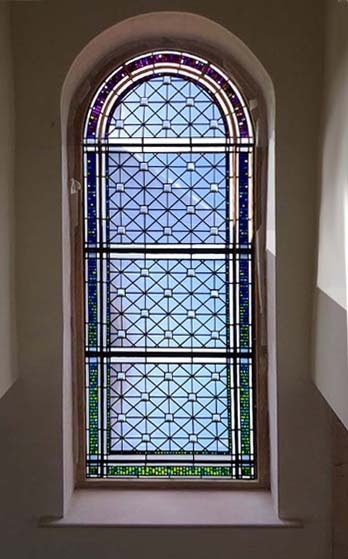 Set of six fused stained glass skylight panels for Airth Castle Hotel. Incorporating fused glass sections and hand made roundels. Lamberts opalescent glass was used for the wings. stained glass glasgow, stained glass glasgow,stained glass glasgow, stained glass Glasgow.